Guardian is the first story in the Creepy Hollow series by Rachel Morgan, these short stories will be published as ebooks on a monthly basis with the second story Labyrinth already available. What I really like about this kind of serialised story is that you never have too long to wait for the next instalment. They also make great quick reads for when you don't have the time to get stuck into a full length book and you just want something that you can read in one sitting. According to Amazon UK Guardian has approximately 47 pages so it doesn't take long to read but for such a short story the author does a good job of pulling you into the world she has created. I don't want to go into too much detail about the plot because it would be easy to spoil it for you but basically the main character Violet is a 17-year-old faerie who is in training as a guardian to protect humans from the dangerous creatures who escape from the fae realm. There are only 2 rules that Violet must stick to - never reveal yourself to a human and never bring a human back to the fae realm - so things go horribly wrong for her when her assignment Nate is not only able to see her but also manages to follow her home. The story is fast paced and I liked both of the main characters. Violet is spunky and has a great snarky sense of humour plus you can never go wrong with purple hair! Nate we don't know so much about yet but he seems quite cute and I liked his reactions to Violet and the fae realm he suddenly finds himself in. I also enjoyed the banter between Violet and Ryn who is her main competition for top of the class in her guardian training. 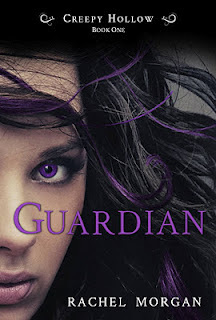 Guardian is a great introduction to the series and left me eager to get started on Labyrinth (I'll be posting my review of that story later today). I'm looking forward to seeing what happens next for Violet and Nate. Sarah, you are bad! I just bought this via your Amazon button! Thank you for the review! If you're able to add it to Amazon (and the other review too) that would be REALLY fantastic! Oops, sorry, guess I should have checked Amazon before I asked that! THANK YOU! these sound really good, I might just have to check them out! @ Raimy - This is a fun series for when you want something quick to read. I hope you enjoy it!